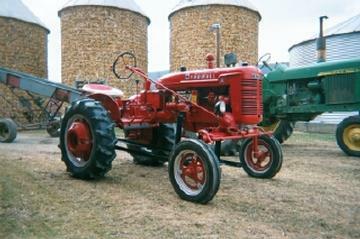 I purchased this tractor at the Kempton, PA community Auction this past february. Although it looks like a champ, these pictures were taken before I had to do alot of work to the axle's, engine, and cooling system. As of 04/23/01, It now run's like a real champ! I've after 3 months of searching IH suppliers and internet sites, finally found a Woods 59L belly mower to compliment the 5' front dozer plow that I also purchased at the auction. It's my first and definatly not the last Farmall I will own! I'm now in search of an IH WF tractor with a minimum 70 Hp. Wish me luck!